Our decision to become pescetarians a few years ago didn’t mean we had to cut out our former favorite meat-filled dishes – we just had to get more creative in the kitchen if we wanted to achieve a similar flavor profile. Hot and sour soup was one of our go-to favorites whenever we would order Chinese food, but we’ve found it difficult to order a vegetarian version in restaurants. Pork is almost always included either chopped, as part of the broth, or both. We didn’t want to miss out on eating it any longer, so we created a recipe for vegetarians out there who may love this soup as well. As far as a comfort food goes, this remains one of our favorite dishes on a cold night. The vegans out there can skip the egg whites if they want to try this meal. Step 1: Begin boiling water in a large pot. Drop in the mushrooms and cook for 10-15 minutes. 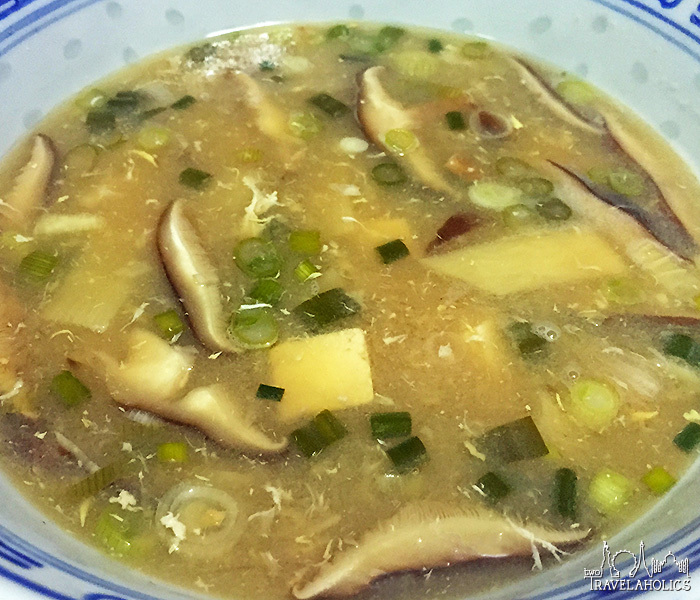 Drain (do not discard the broth), pat dry and slice mushrooms. Step 2: Combine mushroom broth and veggie broth in the large pot, adding ginger and garlic over medium-high heat. When contents begin to boil, add the sliced mushrooms. Step 3: After cooking for 5-10 minutes, reduce heat. Add vinegars, soy sauce, pepper flakes, tofu, and bamboo shoots. Continue to simmer for another 5 minutes. Step 4: Whisk cornstarch into a small amount of room-temperature water in a bowl and add mixture to soup pot. Cook for another 5 minutes. Step 5: Turn off heat. Whisk egg whites into soup to create thin egg strands (don’t stop whisking as you pour the whites into the soup). Add remaining ingredients (green onions and sesame oil) and stir to combine. Serve with rice, rice noodles or by itself. Top with culantro and add chili oil to taste. Enjoy!